The north-west corner of New South Wales (NSW) comprises four arid catchments that, unlike the rest of western NSW, are not part of the Murray-Darling Basin. The Lake Frome, Lake Bancannia, Bulloo River and Cooper Creek catchments are all internal drainage basins with no outlet to the sea. The Lake Frome and Cooper Creek catchments are part of the Lake Eyre Basin. The Lake Frome catchment lies north of Broken Hill along the NSW-SA border. Ephemeral streams flow westward across the border terminating in ephemeral lakes and swamps in the Strezlecki Desert. The Cooper Creek catchment is located north-west of Tibooburra along the NSW-Queensland border. Water flows north across the border to Cooper Creek which eventually enters Lake Eyre. Lake Bancannia catchment is located south-east of Tibooburra. The ephemeral streams in this area flow to a series of fresh and saline lakes. The Bulloo catchment lies to the east of Tibooburra. The Bulloo River flows from Queensland, terminating in an expansive area of floodplain and wetlands known as the Bulloo Overflow south of the Queensland border. the Bulloo catchment has a total area of 75,610 square kilometres, with 20,380 square kilometres (27%) of this area lying within NSW. 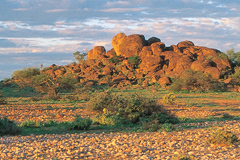 The landscape of these catchments is dominated by flat gibber plains and sand dunes with occasional stony ranges rising up above the plains. The city of Broken Hill, just outside the catchment boundary, forms the major service centre for the region. The only other towns in the region are Tibooburra and White Cliffs, both with very small populations. Most of the small streams within the NSW portion of the Lake Frome catchment terminate in shallow lakes and floodouts in the Strzelecki Desert, contributing no run-off into Lake Frome. The major creeks from south to north are Morphetts Creek, Teika Creek, Floods Creek, Packsaddle Creek, Lake Wallace Creek, Yandaminta Creek and Cooney Creek. Streams north of Milparinka flow towards Lake Callabonna in South Australia, with the major ones being Yandama and Tilcha Creeks. Lake Bancannia catchment features a number of ephemeral lakes with their own local drainage systems. The major ones are Yantara, Ulenia, Salt Lake, Yantara, Bullea, and Bancannia. The Bulloo River begins in the Gowan Ranges north of Quilpie in Queensland. Its major tributaries are Blackwater, Winbin and Gumbo Gumbo Creeks. Just north of the NSW border the river enters Bulloo Lake and, during large events, spills south across the border to Caryapundy Swamp and the Bulloo Overflow. Local run-off to the overflow is carried by Berawinnia Creek from the east and Twelve Mile Creek from the west. Cooper Creek is formed by the junction of the Thompson and Barcoo Rivers 40 kilometres north of Windorah in Queensland. The major tributaries are the Barcoo, Thomson, Darr and Alice Rivers, and Lansborough, Towerhill and Torrens Creeks. The small NSW portion of the catchment drains north via Warri Warri Creek which flows into the Cooper near Noccundra in Queensland. Grazing accounts for 90% of the region's land use. Most surface and groundwater use is for stock, domestic and town water supply. Access to reliable water supplies in this arid part of the state is an ongoing challenge for industry and town water supply. Groundwater supplies are generally saline and useful only for stock watering. The north-west corner of NSW supports a number of major ephemeral wetlands recognised nationally and internationally as significant waterbird habitats. Over 274,300 hectares of wetlands occur between the four catchments. These include large saline lakes and freshwater lakes that can hold water for very long periods, and extensive floodplain wetlands associated with the Bulloo River.